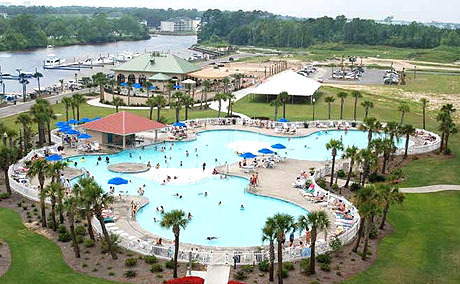 Barefoot Resort may be one of the most under-appreciated treasures in North Myrtle Beach. Because most everyone wants that oceanfront view from a condo, buyers are often set on beachfront. But there is a lot to be said about a condo that's a few blocks from the ocean...lower insurance, better protection during a hurricane, appliances lasting longer without the constant salt wind pounding them. An air conditioning unit on an oceanfront condo has a very short shelf-life! Barefoot Resort is set around several championship golf courses. Rentals are plentiful even during the off-season due to golfers coming in. But best of all, during the summer the complex provides a shuttle service hourly back and forth to the ocean, which can often be more convenient than trying to carry your gear. Barefoot also has a private cabana, bathrooms, and shower at the beach for owners and guests. There's a lot to like about a condo at Barefoot Resort! 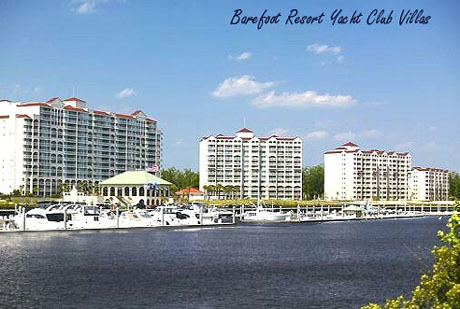 The crown jewels of Barefoot Resort are the Yacht Club Villas that overlook the Intracoastal Waterway, a full service marina, and sometimes can include a boat slip with purchase. These beautiful luxury condominiums are spacious, designer decorated, full of upgrades, and include one of the biggest and most beautiful swimming pools you've ever seen. There's also an on-site restaurant, and a water-view courtyard with flowing fountains, comfy seating for get-togethers, and even outdoor fireplaces to warm the cool winter nights. Good music comes through pleasantly from multiple speakers as well - not too loud, but just perfect to set the ambiance for a romantic evening enjoying the boats and twinkling lights of Barefoot Landing across the water. Four of the finest Championship golf courses in the Grand Strand include Barefoot's Love, Dye, Norman, and Fazio courses. The huge residential community of Barefoot Resort spreads over 2300 acres of pristine greens, natural lakes, ponds, and the Intracoastal Waterway. 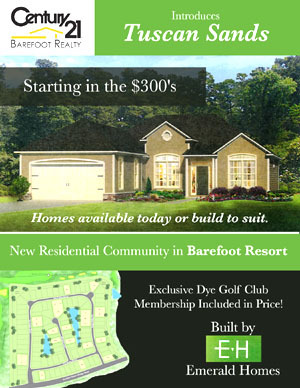 For more information on each of these communities and available condos for sale in Barefoot Resort, see the sidebar on this page and the page for single family homes in Barefoot Resort.